Abbie Hoffman, class of 1959, once said in a rarely-heard interview that he hoped to give his papers to Brandeis University. 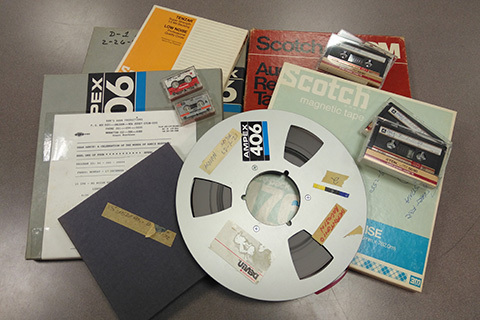 Recently, donor Keith Armonaitis approached us with a collection of old recordings from a deceased fellow documentarian and friend Stuart Hutchison, or "Hutch" for short. Hutch was interested in the counterculture of the '60s, and his audio recordings have recently been given to the Brandeis University Archives to honor Abbie’s wish. These recordings are on various media, including reels and cassettes. Archives do not risk playing this media; rather, they send them out for professional digitization, which means we do not know very much about the content. What we do know is that there are a series of interviews in 1989 with Hoffman — most of which have never been heard outside of Hutch’s circle of friends and colleagues. Other media have labels with names such as Philip Agee, Allen Ginsberg, and Kurt Vonnegut. Brandeis is working to fund and digitize this material and determine whether the content exists anywhere else. Taking into consideration copyright limitations, we will eventually make as much material as possible accessible to the public.